Okay, this doesn’t fit into the usual category of posts on this site but…How do you get natural peanut butter to mix well? 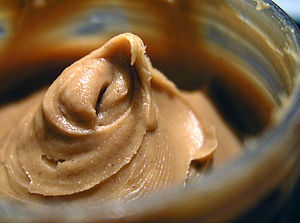 I love the taste of natural peanut butter but when you open the jar for the first time, the oil is sitting on the top. So, you stick a knife or spoon in and start stirring. Usually, I’m not careful enough and some of the oil spills out. Or, I give up after a bit and just start eating. But, not stirring it well enough means that when I get to the bottom, the peanut butter will be dry and hard. So, how do get it to mix well? Think Home Depot would let me bring my jar to their paint shaking machines (used to mix paint really well)? I wonder if that would do the trick. Before you refrigerate it, try turning the new jar bottom up and let it set for 24 hours. Then stir. Some of the oil will start working back up toward the bottom of the jar. I store the jar upside down until I open it for the first time. This causes all the oil to be under the peanut butter before I start stirring so I don’t spill any over the side as I stir. I use a long thin Ice tea spoon and move it up and down before using the typical stirring motion. I also do not store it in the refrigerator after stirring because then if I did not stir it well the first time there is room for “improvement” the next time to stir again and avoid getting to the end of the jar with a dry hunk of peanut butter. Happy stirring!! Also a fan of storing the natural PB upside down! Makes it much easier to stir.